Mangalarga horses are from Brazil. They were first developed by Francisco Gabriel Junqueira (Baron of Alfenas) who bred Royal Alter stallions from Portugal with colonial horses in Brazil. This mix also originated the Mangalarga Marchador breed that differs from Mangalarga horses because Mangalarga Marchador’s have different, and unique, smooth gait. 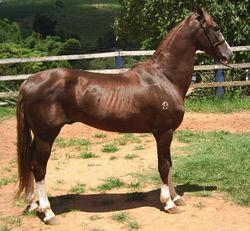 When the Junqueira family moved to Sao Paulo, the topography and local culture forced them to look for a horse with different characteristics and so they started to cross breed the Mangalarga with Hackney, Morgan, American Saddle, Hanoverian, and Trakehner horses. This made the Mangalarga a completely different horse breed form the Mangalarga Marchador. They are so different that each one has its own studbook. Mangalargas are registered at ABCCRM.